Dezeen has teamed up with Japanese brand Muji to give away 10 travel-size aroma diffusers, which can be packed up and used on the go, in our latest competition. This competition is now closed. Congratulations to the winners, which are Edward Eastham from Edinburgh, Scotland, Katharine Phillips from Harringay, England, Jake Archer from London, England, Joshua Brooks from Cardiff, Wales, Kelly Knowles from Woodhall, England, Marek Wierzbicki from Wroclaw, Poland, Anna Thoss from Farjestaden, Sweden, Shelley Jessup from Yorkshire, England, Joel Rojas from Puebla, Mexico, Shirin Kaur from New Delhi, India. Muji's Portable Aroma Diffuser is a miniature version of the brand's room devices, which can be carried around to use while travelling, at the gym or in the office. Muji's essential oils – perfumes typically used in aromatherapy – are released from Muji diffusers to provide a freshening scent and calming atmosphere. The portable version is effective up to a range of 50 centimetres. 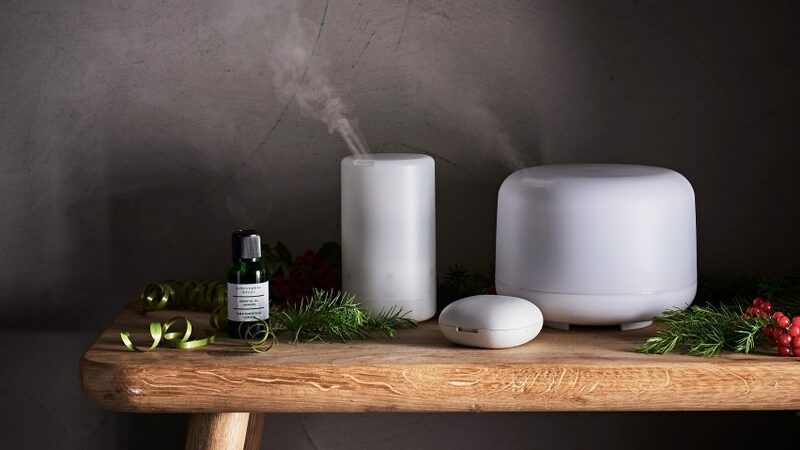 "Part travel accessory and part personal wellness technology, the diffuser is the perfect gift for anyone looking for the newest gadget on the market," said Muji. To make the device compatible with being on the move, Muji fitted it with a small fan so that it needs just a few drops of oils, rather than water. Its rechargeable battery can be charged via a laptop with a USB cable, and lasts up to eight hours. The palm-sized device is completely white, in line with the Japanese retailer's paired-back aesthetic, and features a simple design. It comes as two elements that twist apart to reveal a felt pad inside a disc in middle of the diffuser, where the oil is added. Once the lid is placed back on, the user then turns it to the left to trigger a light that indicates it is at work. The scent is released for two hours without a USB connection, before the device automatically switches off. The Portable Aroma Diffuser comes with a black cushioned case accompanied with pockets inside to hold a charging cable and a 10-millilitre essential oil bottle. Ten winners will each receive a Portable Aroma Diffuser, a transport pouch and a selection of Muji's essential oils. Founded in 1979, Muji produces a wide range of products featuring a pared-back design and simple branding. In an interview with Dezeen, art director Kenya Hara likened working for the company to "spinning circus plates". Competition closes 12 December 2018. Ten winners will be selected at random and notified by email, and their names will be published at the top of this page.